They say you shouldn't judge a book by its cover, but this one's striking jacket grabbed my attention, prompting me to read the blurb and then give this new-to-me author a go. (I'm also a fan of Canadian crime writing, and books set in the wilderness, so several boxes ticked even before I'd read a page). Overall, I enjoyed the read. 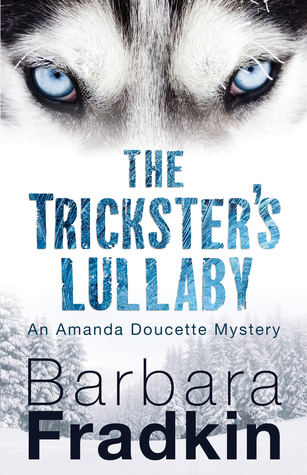 The Trickster's Lullaby is a good page-turner where Fradkin, who was a psychologist before becoming a well-established author with two previous mystery series, crafts an intriguing tale with plenty of 'what's going on?' and 'what's going to happen?' narrative drive. I hadn't read the first book in the Amanda Doucette series, Fire in the Stars, but Fradkin gives new readers enough background to have a good grasp of her heroine's traumatic history, and how it might be affecting her current choices. Doucette has been an overseas aid worker who's seen the worst of what humanity has to offer, who has witnessed the potentially devastating effects of prejudice against those tagged as 'different' or 'other' in some way (particularly by those holding power). She's still looking to rebalance and reset herself by spending times in the peaceful Canadian wilderness, and by helping kids who come from different cultures to share experiences and perhap grow understanding. There's plenty going on in The Trickster's Lullaby, and most of it works very well. Fradkin delves into the psychological ramifications of the trauma Doucette has witnessed, as well as social and political issues like the online recruitment of disillusioned teens by radical figures. It's an action-packed story set against a beautiful backdrop - the Laurentian Mountains in Quebec. The winter season adds to the sense of isolation and hovering danger, as Doucette and the schoolkids are beset by challenges from without and within. The group dynamics, challenges of dealing with teenagers, and the wild environment are all evoked with a nice sense of authenticity. Personally, I found it a little tough to warm to Doucette. She's an interesting character with a fascinating backstory, but one I felt at a little bit of a distance from, rather than being right alongside. She seemed to make illogical decisions that were more about herself (proving something to herself?) than caring for the kids or doing what might be right in a situation, despite her experience. I was still compelled to find out what happens/ed, but I wasn't quite pulled in as much as I'd hoped. Maverick characters are a staple of storytelling, of course, but this felt a little different, and didn't quite click. Despite this minor quibble, overall I really enjoyed The Trickster's Lullaby, and I'd definitely read more of Fradkin's mystery writing, and more of the Amanda Doucette series. A good solid four-star read that just had the occasional wobble or off-note that meant it didn't quite reach five-star status.